Glidecoat is offering a unique opportunity to be apart of an exclusive testing program for our new Prop Optimizer! Over the last two years we have continued to develop and improve our existing Prop Optimizer product to create an even better solution for marine growth on props and running gear. Like our original formula, Prop Optimizer utilizes Nano technology to seal microscopic pores, scratches and nicks on the prop and running gear, creating a diamond hard, smooth surface, preventing marine growth from adhering to the surface. In addition, our new formula includes an antimicrobial agent that helps eliminate marine growth. 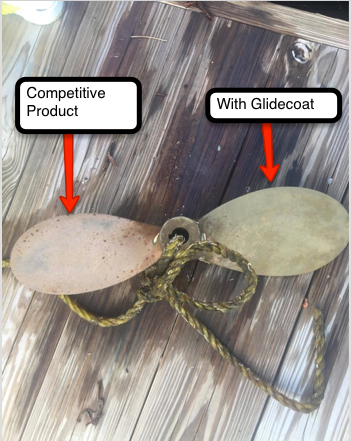 In the summer of 2017 we applied our new coating formula on a two blade prop versus a competitive product, and dropped it off a dock in Pompano, Florida. Throughout the course of the year we periodically monitored the performance of the coating, and the results have been nothing short of amazing! It has now been a full year since we dropped our test prop and we still have no growth on the prop blade with Glidecoat. The picture below was taken 3 months after applying Glidecoat Prop Optimizer Kit on one blade and a competitive product on another blade. As shown, in the picture, the blade with Glidecoat has no growth, however, the blade with the competitive product is starting to have marine growth. The picture below was taken 9 months after applying Glidecoat Prop Optimizer Kit on one blade and a competitive product on another blade. 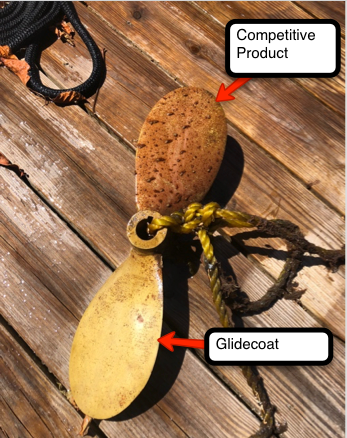 As shown, in the picture, the blade with Glidecoat continues to have no growth, whereas, the blade with a competitive product is showing significantly more marine growth than from the 3 month mark. The next step in our testing process is to get our new formula on boats across the country for true field testing, all in different areas providing different water conditions. Our goal is to perfect our product in order for it to work in any and every marine environment across the country. We are looking for qualified dealers to participate in our testing program for our new Prop Optimizer. This program will include a 50ml Prop Optimizer Kit for a small fee of $50 ($349.95 savings off retail). Our 50 ml Prop Optimizer Kit, will allow you to coat up to 2 props with 18 – 24″ blades. In order to qualify for our testing program we ask for a commitment to applying the Prop Optimizer coating on a boat that is stored in the water, with periodic updates of the performance of the coating every 3 months. This information will allow us to further enhance our coating and provide our customers with the best prop solution on the market. Contact us to take advantage of this exclusive testing program.